Former Football Association (FA) chief executive David Davies says Wales has a good chance of hosting Euro 2020 games in Cardiff. The tournament will be hosted across 13 cities and the Football Association of Wales (FAW) has applied to host group-stages matches and a last-16 tie at the Millennium Stadium. "There are strong reasons why they might be successful," said Davies, but added: "My concern would be the competition from other British bids. "I think Wales is very much in competition with Scotland and England." The FAW is confident its bid will be successful. It says the Millennium Stadium has already proved it can successfully host major sporting events such as FA Cup finals and the 1999 Rugby World Cup final. Also, the Uefa Super Cup will be played at Cardiff City Stadium on 12 August 2014. Davies, who now works as a football administrator, says Wales has a very good reputation. "Wales is a popular nation within Uefa," said Davies. "The Uefa Super Cup is a very good example of that. So they have a good track record. "Wales and the Millennium Stadium particularly has hosted some big name countries over the years. 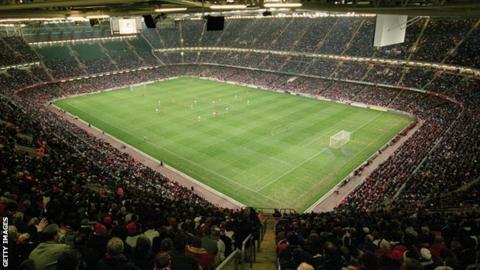 "I've never heard a complaint about the Millennium Stadium or indeed Wales as a host country." Davies says the FAW will also need to work hard behind the scenes to win their bid. "The history and tradition of a venue matters," said Davies, "but ultimately it's also a question of lobbying, pressing the flesh and influencing people. "These decisions will be taken by the Uefa executive committee which brings together the great and the good of European football from all over the continent. "There is no substitute for hard work with that executive committee."